As probably everyone in Austria knows, due to the wonderful sea, people and food, Croatia is a tourist summer destination. That’s why I decided to go to Croatia in order to experience this summer dream for a whole semester. I started taking Croatian lessons in the first semester of my studies, in order to be prepared for the challenge of facing the Croatian culture and language for a whole semester. As a student of economics, it was no problem at all to have Croatian as a foreign language, since we need to learn another foreign language besides English during our studies. 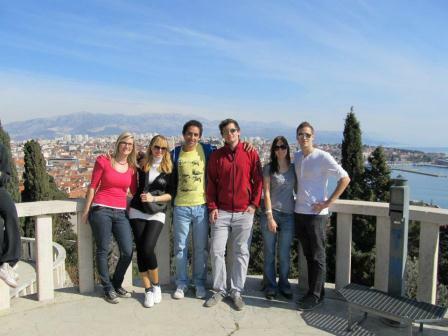 When arriving in Split in February 2012, I was thinking, am I really going to live in this wonderful place for the whole semester? However, when I first started speaking to inhabitants, I faced a problem: Was I really learning Croatian language at the faculty? Normal conversations which were practiced at the faculty turned out to be more challenging than expected due to the dialect spoken in Split. For example, phrases like “di si“, “šta ćeš“ and “di ćemo“ (to name but a few) made me doubt my knowledge of Croatian. Nevertheless, the locals were willing to explain the phrases over coffee and also practice them with me in order to help me feel like a one of them. The Faculty of Economics in Split, where I was going to spend the whole semester was already waiting for me, as well as the professors and the International Office. They were always ready to help me out in situations that required a help of locals. Therefore, I want to advise everyone who is taking a visa in Croatia as a European Union citizen to go to the local police station with a Croatian because the administrative burden can make you go crazy, unless you are willing to take a week-long holidays. Nevertheless, this little burden is nothing compared to the beauty the country is giving you when you live there. The wonderful land and seaside, as well as the openness of the people and the beauty of the culture are things I never want to miss again. When coming to Croatia, I learned that the beauty of life just lies in enjoying every moment, even if it means sipping a cup of coffee for 3 hours at a terrace. If you are wondering why people enjoy it so much, you will get the answer soon; It is because of “fjaka“. Last but not least, I want to say that now I cannot imagine living without the beauty of Croatia, and especially the beauty of Split. 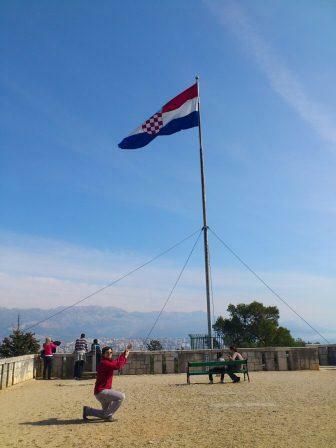 Not just because of the wonderful ambiance that made me want to come back to Croatia, but also because of all the new friends I met and experiences I had there – I lost my heart in Dalmatia. Therefore I want to say: “Fala lipa Splite“, which means “Thanks a lot Split“, and I hope that I can enjoy your beauty again soon.